Start Planning Your Vacation... NOW! We all understand the benefits of vacation time for our personal relationships, mental and physical well-being, and professional success. However, more than half of Americans (52%) leave unused vacation days on the table each year. That’s why we’re all in for National Plan for Vacation Day – January 29, 2019. It’s one day set aside to put your vacation days in play! Research tells us that individuals that plan their vacations are more likely to use all of their time off, take more vacation days at once, and report greater levels of happiness in every category measured. Prince William, Virginia is encouraging Americans to plan their vacations at the beginning of the year by participating in National Plan for Vacation Day on January 29, 2019, to ensure they enjoy their well-deserved time off in 2019. Below are some tools to help you plan and a few reasons why we think Prince William, VA might be the perfect getaway for you. From learning about American Civil War Battlefields to taking in the summer sun along the shores of the Occoquan or Potomac, from huge outdoor music concerts at Jiffy Lube Live to shopping all day and night at Virginia&apos;s Largest Outlet Mall - Potomac Mills - you need to begin planning your many trips in 2019. Plan for your vacation today in Prince William! 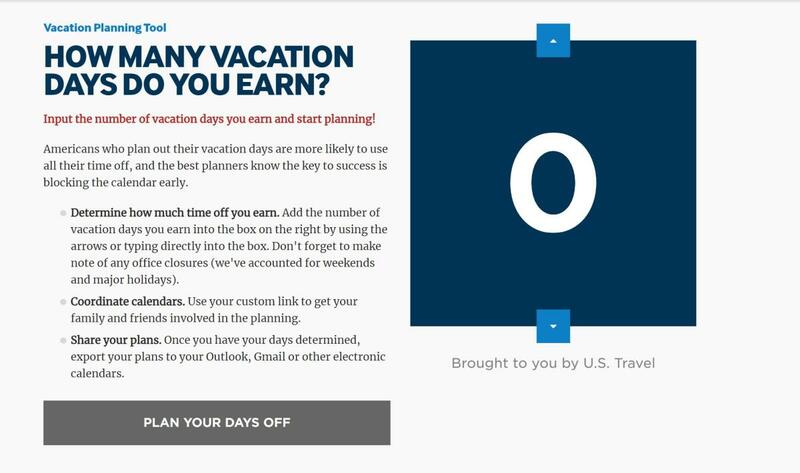 This vacation calendar tool allows you to plug in your number of days off and start arranging them to visualize your vacations. Share with friends and family and then export to Outlook, Google Calendar or another scheduling app. According to research by Project: Time Off, 212 million vacation days are forfeited annually. Don’t let your hard-earned days add to this statistic. Begin your year with time already set aside to make your vacation plans a priority.